In competitive markets businesses need to embrace two sets of capabilities that are often seen as complete opposites – they have to be fast & creative, while also being productive & scale driven. 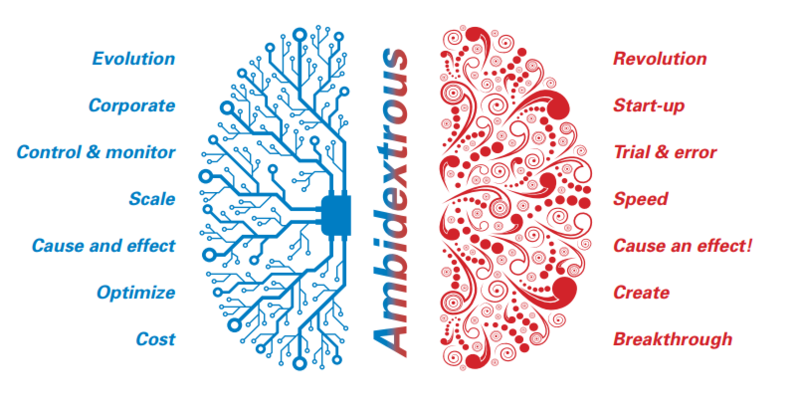 This article explores how businesses can become truly ambidextrous, providing an outline model that helps to create the right balance within the organization. Where does my organization currently stand in terms of its set of organizational capabilities? What organizational capabilities does my business need, considering both the strategic context and business requirements? What kind of organizational development path is needed to build a sound balance between scale & productivity and speed & creativity? The most obvious and tangible benefit of this organizational canvas is that it enables management teams to discuss organization development issues in a common language and make decisions on development aims and organization transformation priorities. 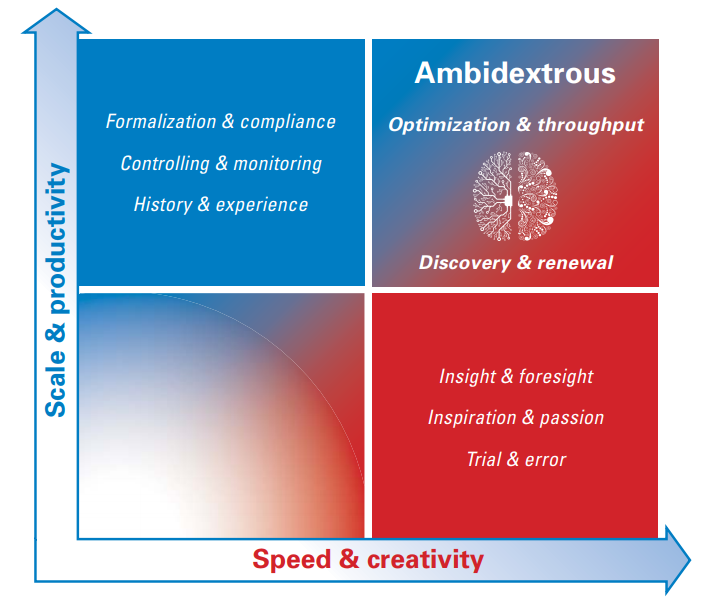 Companies can be defined as “ambidextrous” when they continuously solve the trade-off between being fast & creative and scale-driven & productive. As such, they establish an equilibrium characterized by a strong emphasis on both dimensions (O’Reilly III, C. & Tushman, L., 2004). The vast majority of companies focus on either dimension, but those that manage to excel in both are rare. Businesses with emphasis on speed & creativity possess strong capabilities that enable anticipation, innovation and adaptation. These translate into corporate attributes such as insight & foresight, inspiration & passion and trial & error. On the contrary, companies that excel in the scale & productivity dimension demonstrate strong capabilities when it comes to planning, as well as optimization and control, resulting in attributes such as formalization & compliance, controlling & monitoring and history & experience. Amazon is a prime example of the new breed of ambidextrous organizations. Always searching for the most innovative business ideas, it strives to deliver on customers’ needs before people realize that they require them. This approach is driven by a well-established culture of invention, curiosity and bias for action. Complementing its creative side, Amazon has also proven itself to be a champion of productivity. Not only its logistics, but also its internal processes for scaling new business models, are tailored for pure efficiency and standardization. If a new approach proves to be successful, it is rolled out rapidly, formally established, monitored and aligned to deliver full productivity. By successfully balancing these two dimensions, Amazon has built a sustainable competitive advantage that has become accepted best practice across multiple industries. Now, not every company can or wants to follow Amazon’s development path, and should not necessarily do so. The art is more in finding actionable organizational answers that specifically address the company’s own business context, taking into account its history, development path, future challenges and strategic targets.